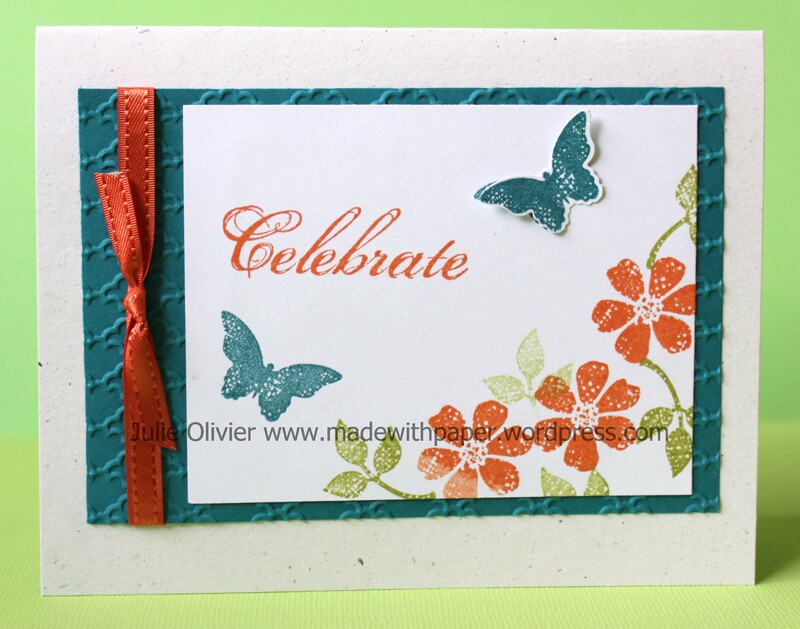 Sale-a-bration set Petite Pretties: a two for one! I’ve been so busy lately with my classes and workshops that I couldn’t post any cards. But today’s a 2 for 1! You get 2 cards in one day!!! The Sale-a-bration set “Petite Pretties” is so cute and it’s made to match the Sale-a-bration punch “Petite Curly Label”! They are two of my favorite items!!! I used both in the two cards I made for you today. It’s not too late to get these 2 items for free! Email me your order before March 22!!! 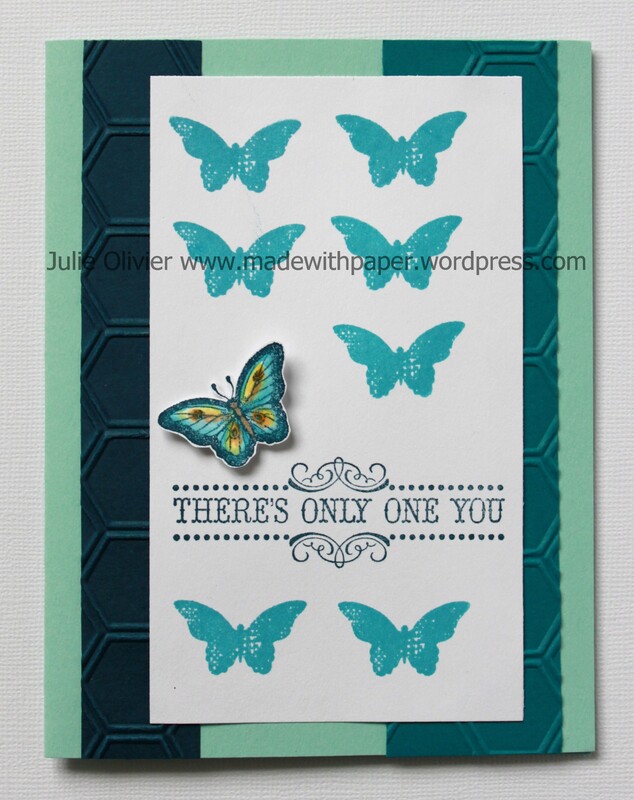 The first card uses the new Honeycomb embossing folder and the Sycamore Designer Series paper (you can get this free too as a Sale-a-bration item!!!). Here’s a little trick I learned for cutting your hexagons to go inside the “honeycomb”. Run a piece of DSP through the Big Shot with the Honeycomb embossing folder and then, follow the embossed lines to cut the hexagons. You will be sure it fits just right!!! I used the Curly Label punch to frame my Petite Curly Label and used the Essential Piercing pack to make the little holes all around for a nice finishing touch. Tools: Big Shot, Honeycomb embossing folder, Curly Label punch, Petite Curly Label punch* SAB, Essential Piercing Pack, Piercing tool. 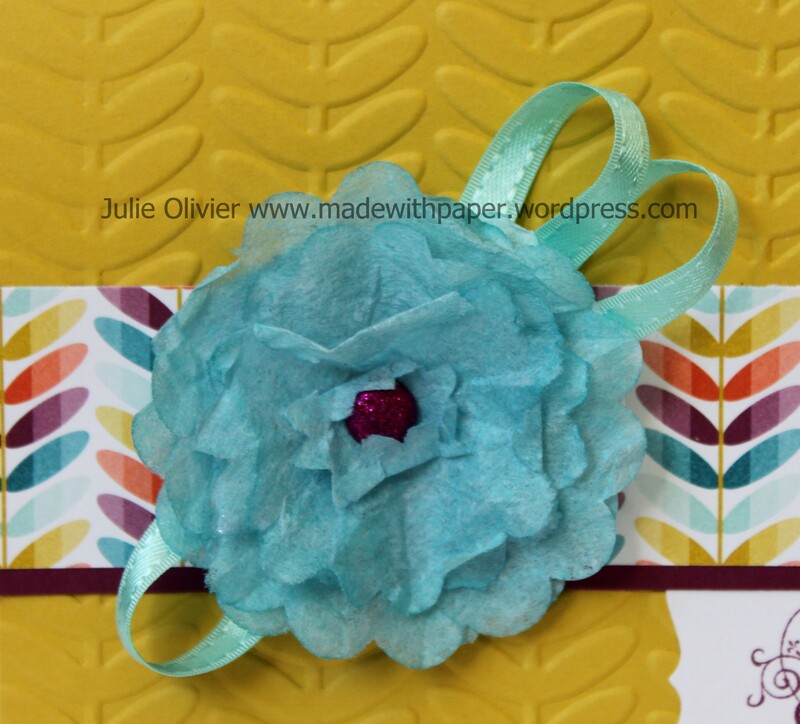 For the second one, I layered the Petite Curly Label on top of the Postage Stamp punch and added a little flower from the Itty Bitty Shapes Punch pack, with a rhinestone to complete it. I took the colors from the Sycamore DSP: Summer Starfruit, Tangerine Tango and Island Indigo. 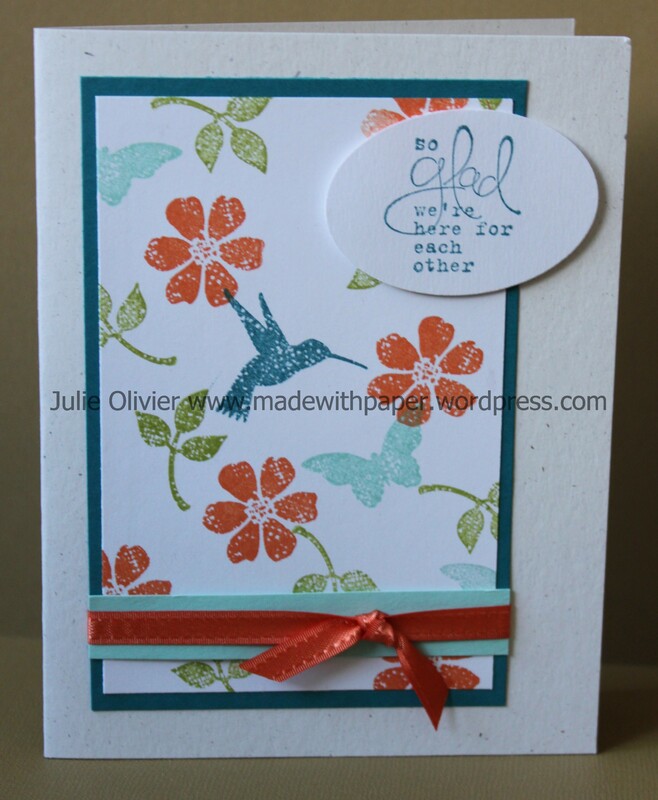 When I started to make this card, it was something completely different!!! You never know how it’s going to turn out after all! 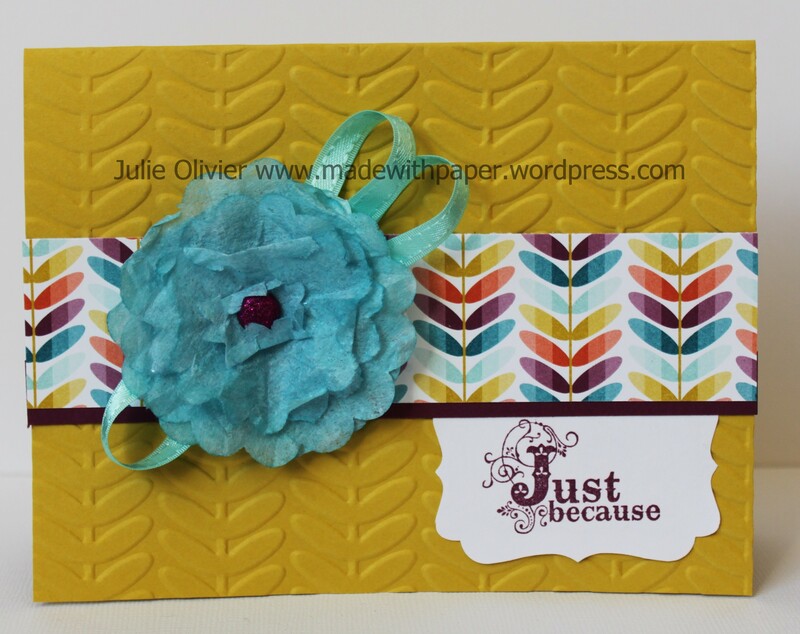 I used the Vine Street embossing folder (the folder you can get as a FREE item during the Sale-a-bration) for the background and a strip of Sycamore Street designer series paper (also a Sale-a-bration item). 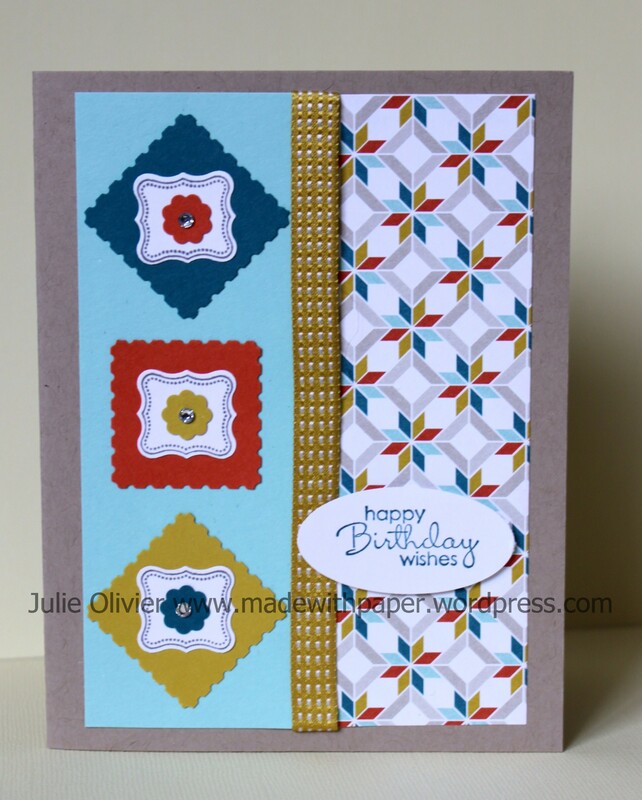 The greeting is from “Vintage Verse”, one of the SAB set, stamped in Rich Razzleberry on Whisper White cardstock and cut with the Decorative Label punch. To make the flower, I used the Creped Filter paper (available in the mini-catalogue p.6). 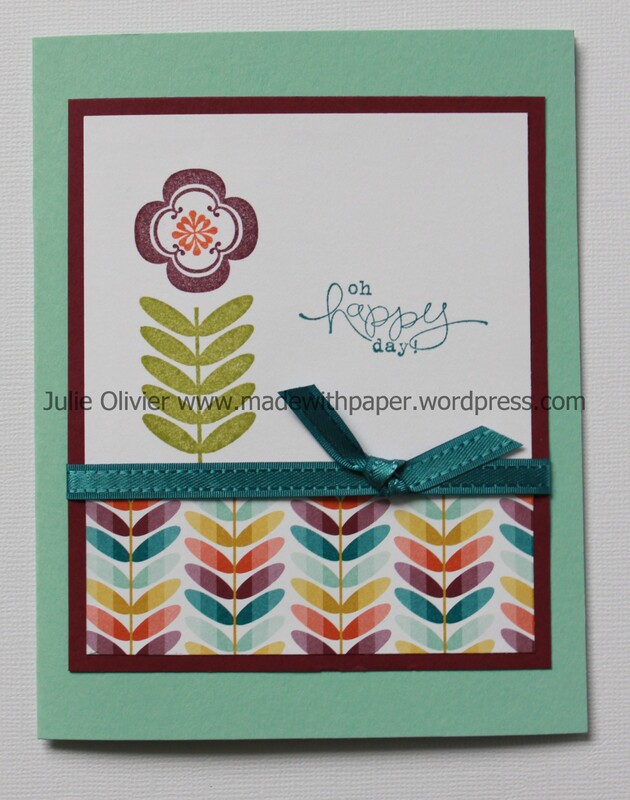 I used the 2-3/8″ and the 1-3/4″ Scallop Circle punches to cut two flowers of each size. I also used the Boho Blossom punch to cut the biggest flower of that punch. Then, with a mixture of rubbing alcohol and Indigo Island ink, I sprayed each flower and let dry. I stacked all the flowers, attached with a Rich Razzleberry glimmer brad and crumpled the flowers to add some dimension. I used glue dots to attach the Pool Party satin ribbon underneath. CS and paper: Summer Starfruit, Rick Razzleberry, Sycamore Street designer series paper, Creped Filter paper, Whisper White. Ink: Rich Razzleberry, Island Indigo.